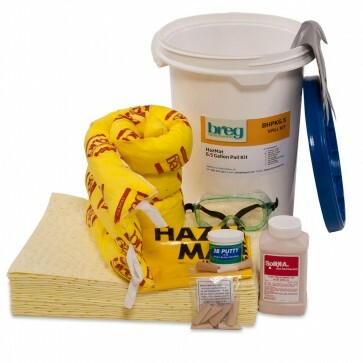 Everything you need to contain and clean up small chemical spills. Breg’s wall-mountable Pail Kit is designed for a quick response to small spills. Just grab the sturdy handle and carry it to the spill site. Reusable, screw-top polyethylene pail is great for temporary storage of used absorbents prior to disposal. Designed to absorb oil and water based fluids, these kits will absorb all fluids including aggressive chemicals.